The trouble with that advice is that a lot of thrillers, supernatural suspense novels and tales of horror would never be written if we followed it. I've written about killers, genetic experiments, financial empires, supernatural powers, espionage, the Middle East and other topics of which I have no personal experience. If I only wrote about what I know, the list would include idiots, self-absorbed and spineless jerks, nutcases, liars, and false friends. Okay, so I could write political novels. As we all know, Washington is full of all of those type of characters. My friend and fellow author, Shelly Arkon, has lately been writing a great deal about matters of faith on her blog. Shelly has spent the past few years studying both the Bible and the Torah and has learned a great deal. While bloggers are often warned about writing about matters of faith in a cheesy manner, Shelly's posts are honest, from the heart and thought-provoking. I've done a lot of thinking myself. I'm a Christian, and I've experienced a great deal in my life that has confirmed my faith--but I still have more questions than answers. I'm by no means an expert, but still I want to write things that make people think and hopefully find a door opened to them that they haven't seen before. So how to do it? Fiction, mostly. In Chasing the Wind, I write about characters who also have more questions than answers: cynical FBI agents, an agnostic photojournalist, a Biblical archaeologist who has faith but challenges it, and an atheist who is called to be a prophet but still can't believe what's happening to him. I put them in situations where they get pushed to their limits and their faith (or lack of it) is tested. They witness miracles. They deal with loss and rise above it. And they face many of the same questions I've faced. I always believed in God--but as the Bible says, even demons believe in God. They know He exists. Believing is not the same as putting one's faith in God. I wasn't able to do that completely for a long time. That door opened for me twenty-two years ago, on a dark night in which I felt more hopeless than I ever had. I went to bed that night, facing a situation for which there seemed to be no resolution. I prayed, more than I ever had before, and was still praying when I finally fell asleep. I was awakened the next morning by what first seemed to be just a ringing telephone, but in fact was God's answer to my urgent prayers--the miracle I needed. 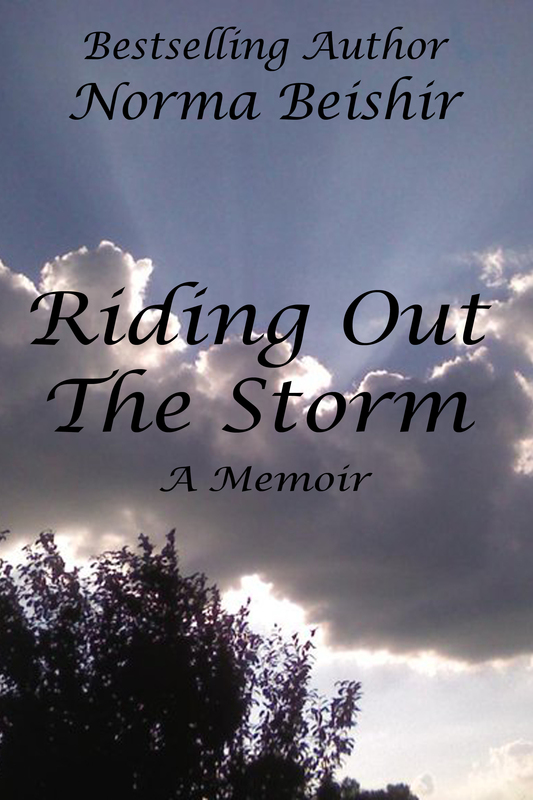 That miracle has led me to write my first work of nonfiction--a memoir that's (finally) almost finished, Riding Out the Storm. It's not easy to lay bare one's soul for all to see, as my close friend William Kendall discovered with his recent blog post. But sometimes, we need to write about the things that make us most vulnerable. Sometimes, as in William's case, it's a way to exorcise our personal demons in order to be free of them. It took tremendous courage for William to share the things he'd kept so private for so many years. For some, like Shelly, it's a way to share our discoveries of faith...and to provide a warning of what's ahead. For me, it's hopefully a means to testify, to show others that anyone can--and will--change. And that it really is darkest just before dawn. That Write What You Know stuff always made me wonder about all those stories about elves and talking dogs. I am looking forward to reading your memoir, Norma! Me too. I guess some people really lead strange lives! Congrats on putting yourself out there. Check back with me after it's published and has had some reviews on Amazon! It'll be great. I just know it. Thanks for reprinting this one here, Norma! Since I'm ending the WordPress blog, I'm going to re-post here some of the posts I did there--since most of my Blogger followers don't do WordPress. We all have storms. They come and go. Shared. Thank you, Shelly. You've been an inspiration! Wonderful post! I was lost and now I'm found! I used to believe and yet my faith was weak until God made me realize He was in charge and I needed to take a back seat and have faith. So glad you have faith too! It wasn't an easy road, but definitely worth it. I admire your decision to tell it all! Most people can only share snippets at a time and I can't imagine writing an entire book on my life. Congratulations on having the courage! Not on my whole life, not an autobiography. Just about a very dark period, how I got there and how faith got me out. Interesting. Since you have read Earthbound, you know my religion is Christian, and I still attend the Lutheran church. Anna is based on my mother's personality. My Pastor during confirmation instructed us to read the Bible and attend the church that we believe follows it most closely. I've done both. On my fifth way through this year. What a wonderful post today especially in these trying times. I remember reading some of these posts on what happened to you, dark times indeed. You are such a strong brave woman. Thank you, Gayle. I only survived those times through faith. One of the benefits of an overactive imagination is that it opens one's heart and mind to the things we can't prove. I've often thought of doing a memoir, but where to begin? It will be interesting to see what you've done, and the way you've left us wondering what that phone call was all about, etc. Oh that is excellent Norma. Have you been working on it for a while or is it in the first stages? If this is going to be your title and cover I think they are perfect! Did Collins design the cover? I've been working on this for a while now. With arthritis and poor eyesight, it takes a longer than it used to. That's the official title. My idea--glad it's getting such a positive response. Collin not only designed the cover, it's his own photograph. I'm really proud of the job he did. I'm not getting any of the royalties for this one. I'm giving the rights to a dear friend who does a lot of wonderful work helping others in need. I know she'll put it to good use. That's really good of you Norma.. you know what they say about karma, kindness is repaid in full.